Through 40 Days of Blogging, you can help fulfill the Great Commission! Over the course of 365 days, at your own pace, create 40 amazing posts. 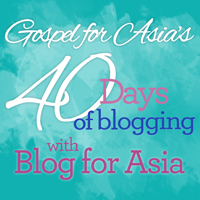 When you sign up to join the Blog for Asia team, you’ll receive access to the 40 Days of Blogging resources, a track within Blog for Asia. This set of 40 powerful stories, photos and videos provides ideas for you to share the plight and redemption of the voiceless and hurting in Asia, especially the women and children. As you share these stories with your unique voice, you and your readers will be able to see how the love of Jesus is transforming lives in South Asia. The posts will also help you understand the mindset that causes such desperate plight for many women and children in Asia, and give you the opportunity to challenge your readers to do something about it. Our heart is to equip you to write meaningful posts about Asia on your blog. In each post in 40 Days of Blogging, we provide you with photos, videos, statistics or other information to create a great post. A few example posts are Day 1: Nepalese Woman Finds Hope and Day 27: Forsaken and Abandoned – Prayer for Widows. Sign-up is easy! Join our blogger team, we would love to partner with you.